A White Coat Waste Project investigation has exposed that a U.S. Department of Agriculture (USDA) laboratory in Maryland breeds up to 100 kittens a year, feeds the 2-month-old kittens parasite-infected raw meat, collects their feces for 2 weeks, and then kills and incinerates the kittens even though they're healthy and adoptable. The USDA is even trying to keep details about the project a secret, but WCW and Congress are fighting back. 3,000 kittens have been senselessly killed in these tests that have cost taxpayers more than $22 million. Is this how you want your money spent? 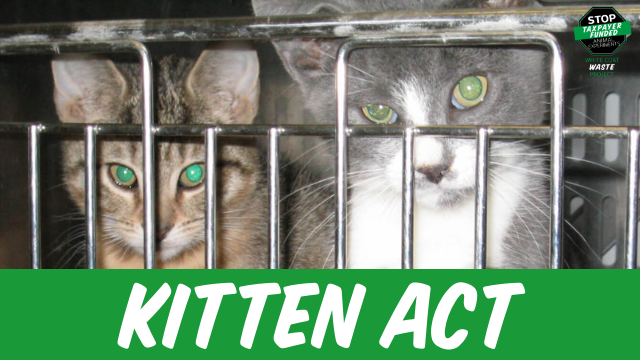 Tell Congress to pass the bipartisan Kittens in Traumatic Testing Ends Now (KITTEN) Act (HR.1622/S.708) to cut funding for the USDA's painful, taxpayer-funded kitten experiments!